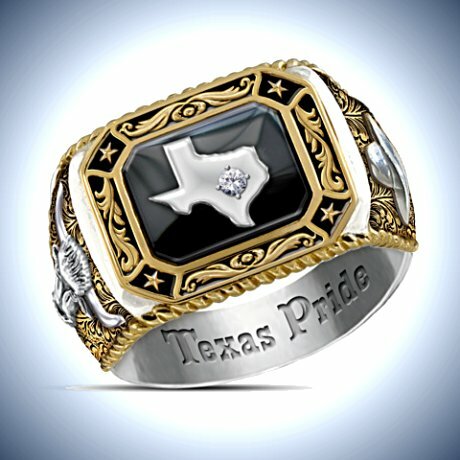 Spirit Of Texas Diamond Men's Ring. Prices, Secure Shopping, Only US Shipping. The Spirit of Texas is in its citizens, and there's no shortage of pride in the Lone Star State. Now, show off your Texas pride with this dazzling diamond men's ring, a fine jewelry design exclusively from The Bradford Exchange. It's the perfect tribute to America's 28th state, boasting a wealth of big, bold style that's as unique as the great state that inspired it. This fine Texas pride jewelry is handcrafted in solid sterling silver. The genuine black onyx center stone showcases the shining state of Texas, hand-set with a genuine solitaire diamond at the site of the state capital, Austin. A tooled leather-look border with Texas stars frames the center stone, highlighted by 18K-gold plating. 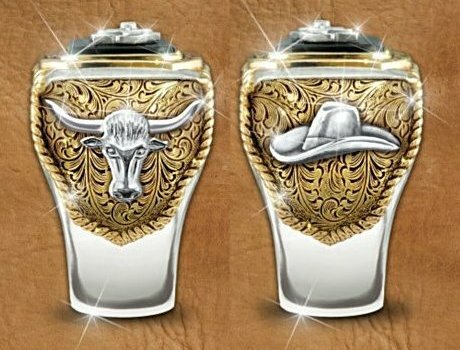 A Texas longhorn and a cowboy hat decorate the sides of the ring, set against an 18K gold-plated design with a lasso-style border. The phrase "Texas Pride" is engraved inside. Huge demand is expected for this unique ring, so hurry - order now. 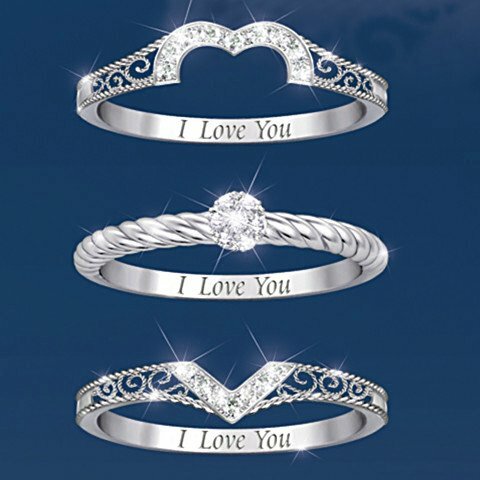 There are three words you can never repeat too often, but now you can say them at least 3 times over with these stunning I Love You diamond stacking rings, a fine jewelry design exclusively from The Bradford Exchange. Wear these unique, handcrafted sterling silver rings separately if you like, or together to form a heart - and triple the romance!Each of the individual bands in this stunning heart-shaped diamond ring dazzles the eye with exquisite details. The top and bottom bands boast elegant open scrollwork and 2 sparkling diamonds each. The graceful center band is set with an additional 7 genuine diamonds. All 3 bands are engraved inside with the words you can never say too much - "I Love You." A custom case adds the perfect final touch. 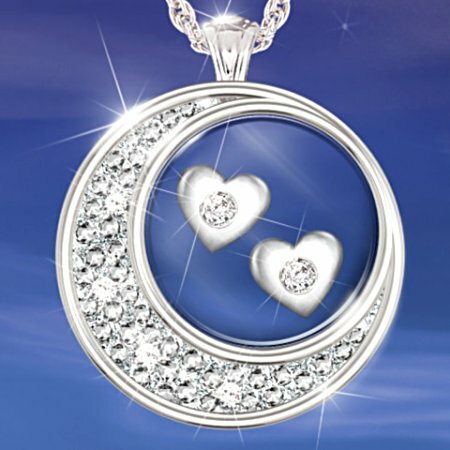 The perfect celebration of love and romance, for yourself or as a gift, but strong demand is expected so don't delay. Order now! Weighing over 110 carats, the famous Sun Drop Diamond of South Africa is the world's largest yellow diamond. Attesting to its brilliant allure, the ring set with this incredible gemstone sold at auction for over $10 million! Now the legendary beauty of the Sun Drop inspires a simulated yellow diamond ring shimmering with over 5 carats of our exclusive Diamonesk® stones. A fine jewelry design exclusively by The Bradford Auction Collection of The Bradford Exchange, the Make Your Own Sunshine Ring sparkles with a radiance that outshines the sun! This spectacular ring is handcrafted in solid sterling silver. The centerpiece is a magnificent Diamonesk simulated canary diamond in an elegant pear-shaped cut, framed with a pave of Diamonesk simulated canary diamonds. The split band is also accented with Diamonesk clear simulated diamonds. Our exclusive Diamonesk simulated diamonds possess a cut, color and clarity that rival genuine diamonds. These stones sparkle with the fire and brilliance of the finest flawless diamonds - but at a fraction of the cost, making our gorgeous Auction Collection jewelry amazingly affordable. Heavy demand is expected, so don't wait - order now! There's nothing as eye-catching as the sparkle of a glistening ring gracefully resting on a woman's hand. After all, it says sophistication and elegance like no other accessory. Now, you can wear a dazzling reflection of extraordinary radiance that is unlike anything else on earth with the African Violets Tanzanite And Diamond Ring, a fine jewelry design exclusively from The Bradford Exchange.Exquisitely handcrafted in solid sterling silver, this gleaming ring features 18 genuine Tanzanite stones, which are among the world's rarest gemstones found only in Tanzania's hills nearby Mt. Kilimanjaro. The Tanzania stones sparkle with a color combination of blue and violet and are set in a custom design to create the petals of three flowers, which capture the delicate beauty of the blossoms that grow on and around Mt. Kilimanjaro. A genuine diamond is set at the center of each flower while a glittering pave frames the flowers on this magnificent women's ring. 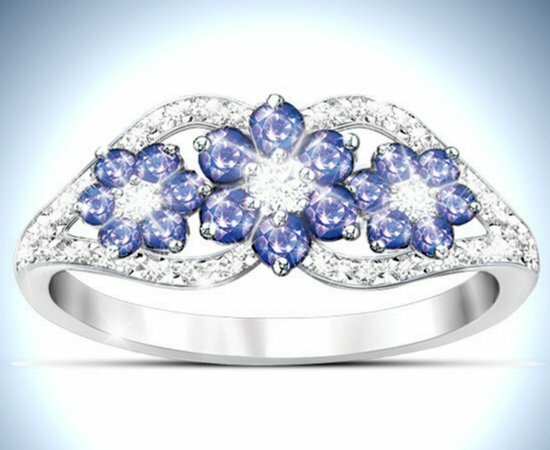 High demand is expected for this Tanzanite and diamond women's ring, so order now! With the strength of faith and the knowledge of God's eternal love, all things are possible. Be reminded of these simple yet powerful beliefs with the Devotion men's religious ring that presents the image of the cross, in a bold yet elegant design enhanced with a brilliant diamond. This fine jewelry exclusive from The Bradford Exchange is a stunning example of cross jewelry for men that also includes a message of devotion, engraved inside the ring to forever enhance its meaning for the man who wears it.Handcrafted in solid sterling silver and plated overall in gleaming 24K gold, the Devotion Men's Diamond Ring is a men's religious ring of distinction and elegance. At the center of the ring, the raised cross design features a radiant solitaire diamond in a sparkling pave setting. Inside the band, the engraved message "I am with you Always" is a constant reminder of the Lord's eternal presence. Each ring arrives in a custom case and gift box. To wear this fine example of meaningful cross jewelry for men, don't wait. Order now! When two loving hearts discover they belong together, their love is like precious ribbons that tie them together for all eternity. Now celebrate the enduring beauty of your own love with the Ribbons of Love Personalized Garnet Ring. This fine jewelry exclusive is available only from The Bradford Exchange, and features a stunning, faceted garnet heart surrounded by 2 entwined "strands" of genuine diamonds and garnets. When it comes to women's jewelry that delights the eye while it speaks of love, there's no more exciting design than this unique ring!This totally romantic ring design is handcrafted in solid sterling silver plated in 24K gold. At the center of the Ribbons Of Love Personalized Garnet Ring is a dazzling, heart-shaped, faceted garnet. "Ribbon" bandings on either side are set with a total of 8 square-cut garnets and pave settings of 4 diamonds. You may make this ring your own when you personalize it with 2 names inside the ring band, engraved for FREE! Strong demand is expected for this richly elegant Ribbons of Love Personalized Garnet Ring, so be sure to order now! Your hearts. Your lives. Your souls. Interwoven in an endless love that is like no other. Now you can wear a dazzling expression of that infinite love in this solid sterling silver diamond infinity ring, hand-set with a dozen genuine diamonds, and made even more unique because it's personalized just for you absolutely FREE! This name-engraved personalized ring is a fine jewelry exclusive from The Bradford Exchange, presenting a dazzling design of two interlocking rings that sparkle and gleam as they speak of timeless romance.These two complementary rings are both finely handcrafted of solid sterling silver. The first silver band features a brilliantly glittering pave of 12 diamonds that completely encircles the band. The second silver band is elegantly engraved with the sentiment "Today, Tomorrow, Always." This diamond infinity ring is then engraved on the inside of the band with two names that you provide to make it absolutely your own. To celebrate a love that knows no end with this exquisite personalized diamond ring, order now! The alluring, mysterious beauty of the Tanzanite first came to light in 1967, and to this day is found only in mines deep beneath Mt. Kilimanjaro in Africa! Now you can acquire this prized gemstone in a yellow gold and white gold Tanzanite ring that captures this prized gemstone at its best, in a fine jewelry exclusive from The Bradford Exchange. Tanzanite's amazing range of colors - combining the cool blue of sapphire and the rich purple of amethyst - have made this gemstone a fashion trend-setter, and this unique ring design surrounds the stone with 30 diamonds for the ultimate statement of luxury.Exquisitely crafted in 10K solid gold with alternating rows of yellow and white gold, the centerpiece of this stunning ring is a faceted oval Tanzanite gemstone with amazing blue-violet luminescence that flashes from every facet. A spectacular array of 30 genuine diamonds set into the 3 rows of multi-colored gold create a dazzling effect that is simply breathtaking. Sure to turn heads wherever it is worn, this yellow gold and white gold Tanzanite ring is expected to generate high demand. It's a unique ring design not to be missed, so order now! Celebrate your partner, your friend, the love of your life with a beautiful expression of the timelessness of your affection. This uniquely elegant three-band diamond ring, a fine jewelry exclusive from The Bradford Exchange, sparkles with a hidden message of boundless eternal love. Eleven genuine diamonds and solid sterling silver mark this stunning jewelry creation, which is actually three rings in one - each one graced with their own engraved contribution to the romantic hidden message of "Today Tomorrow Always. "Expertly handcrafted, this radiant engraved women's ring brings together three shimmering bands. The center band features a flower-shaped cluster of seven diamonds with a single diamond solitaire, in an intricately sculpted setting, on either side. The top and bottom matching bands complement with solitaire diamonds of their own. Each individual band in this glorious trio can be worn on its own or coupled together for a dazzling display of devotion. Makes an extra-special way to show everlasting love today, tomorrow and always. Order now! Give your daughter an exquisite reminder of the special love between you. She'll fall in love with this engraved daughter jewelry gift featuring an elegantly handcrafted solid sterling silver heart-shaped diamond pendant. A glittering ribbon of 3 genuine diamonds in a pave setting flows down the center of the heart symbolizing: today, tomorrow and always. As seen on Lifetime Television's "The Balancing Act. "A decorative sterling silver chain runs under the diamonds, reappearing on the other side of the heart for a distinctive design. The back of the heart is engraved with the loving sentiment: "My precious Daughter, I love you today, tomorrow and always". This fine jewelry exclusive from The Bradford Exchange is perfect for every day or dressy occasions. Arrives in a velvet jewelry pouch and gift box, ready for gift-giving. Strong demand is expected. Order now! With a fashionable and contemporary design fit for royalty, the Majestic Diamond Cluster Ring is sure to take your breath away! Shimmering with the glory of 41 genuine diamonds, it is a truly impressive fine jewelry design only from The Bradford Exchange. Glamorous enough to wear to the most lavish events, but classic enough to wear every day too, this stunning diamond ring is the epitome of style. Exquisitely handcrafted of solid sterling silver, this Majestic diamond ring features a unique design, created by the wealth of precious gems gracing the top of the band. It casts an eye-catching gleam with 18K gold-plated accents, and even arrives in a custom presentation case, perfect for safekeeping or gift giving. Strong demand is expected for the Majestic Diamond Cluster Ring, so don't miss this opportunity. Order now! Midnight calls with the promise of enchantment that awaits under the moon and stars. Now, the beauty of this captivating hour is expressed in a spectacular jewelry treasure from The Bradford Exchange. Introducing our Midnight Serenade Diamond Ring, shimmering with 34 genuine black and white diamonds in an exclusive fine jewelry design. Perfect for pairing with eveningwear or for adding a flourish of elegance to any ensemble, it's as enchanting as it is stylish!Handcrafted of solid sterling silver, this black and white diamond women's ring evokes the glimmer of moonlight against the midnight sky. The contrast of 18 genuine black diamonds and 16 genuine white diamonds, set in a glittering pave, creates a pattern of cascading ribbons that sparkle like midnight. Your diamond women's ring comes in a custom presentation case that's perfect for gift-giving. But don't wait, strong demand is expected for the Midnight Serenade Black and White Diamond Ring. Order now! Imagine two precious, jeweled hearts embraced by another lavishly jeweled heart, to symbolize your own hearts linked together forever! The Love's Embrace Diamond and Ruby Ring shows your two hearts joined in a perfect union with 10 stunning rubies and 2 brilliant diamonds in this fine jewelry exclusive from The Bradford Exchange. You will love this personalized jewelry for the rich look of the precious stones as well as the heartfelt romantic design, truly unique among women's rings!This exclusive design is exquisitely handcrafted in solid sterling silver and richly plated in 24K gold. Two open hearts with 2 diamonds in sparkling pave settings represent the two of you. A third open heart - set with 10 rich, red rubies - embraces the 2 diamond hearts to create the ultimate statement of love. To make this diamond and ruby ring even more personal, you may engrave 2 names inside the ring band, absolutely FREE! We're sure to see strong demand for personalized jewelry of this high caliber, so don't wait. Order now! Every woman deserves to feel like a queen, and now she can with a breathtaking jewelry creation that shimmers with richness and splendor. Introducing the Luxury Pink Topaz & Diamond Ring, a fine jewelry exclusive available only from The Bradford Exchange. Showcasing a magnificent pink topaz center gemstone, it makes a stunning fashion statement that's sure to turn heads!An artful pairing of pink topaz and diamond gemstones, this stunning ring is exquisitely handcrafted in solid sterling silver. Aptly named, it's the epitome of luxury! The ring's centerpiece is a square-cut pink topaz, complemented by a total of 12 genuine diamonds in a custom design that's pure sophistication. Your pink topaz ring arrives in a deluxe gift box for elegant presentation or safekeeping. But strong demand is expected, so hurry. Order now!